During the 1990s my vacation trips to Western Europe always excluded the Iberian peninsula, i.e. Spain and Portugal. 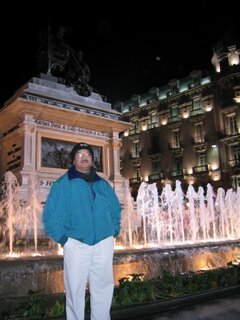 Frankly, I then had my cultural baggage/bias against Spain and its people --more precisely, against the Spanish hybrids (mestizos) who I took as representative of all, including pure/real Spaniards in Spain-- we Malay Filipinos learned or know about in the homeland. I tend to forget however that my closest woman-friend ever was of Spanish descent and Spanish-speaking; and that I have thankfully learned much during my grade/high school years from Spanish and Italian priests who belong to the Salesian Order of Don Bosco (some of whom were close to my now-departed parents). I venture to guess or claim that it is a truism wherein white colonizers in the colonies are oftentimes "behaving badly," to put it very lightly and politely; these colonizers were arrogant, lazy,fearful, brutal, etc. because they were an elite of usurpers, had undeserved positions of power in the colonized lands --we might as well throw in with them their colonial pretenders (locally bred or hybrids/mestizos) who deservingly earned their negative stereotypes. Colonizers of history, including "innocent" America in our own history, given their racism built into the system and seeing colored natives as subhuman, destroy the colonized but also rot themselves. Spanish colonization created our nationalism/patriotism, American colonization destroyed it. And we natives have to rediscover it -which is much way overdue. Our fellow Asians: Indians, Chinese, Vietnamese, Malaysians, etc. found/rediscovered their nationalism, fought and sacrificed for and won their places in the sun. And we, always lamenting our proclaimed "second to Japan" status in post-WW2 Asia (think deeply, were we really? ), wonder why these neighbors are now "with the Joneses" and us left in the dust. Compared to these fellow Asians, we native Filipinos -led or ruled by many traitors since the beginning of the 20th century to the present- sadly seem to have lost our balls to fight for our own territory, for our own nationalism, for our own and future generations and thus give away our patrimony and sovereignty to foreigners: our forest denuded, our mines taken, our nascent native industries shutdown, our aagriculture devastated, our banks taken over and all profits repatriated; our women degraded and ravished; and lands either turned to serve rent capitalism or golfland - our homeland becoming the cheap playground of foreign businessmen/residents and tourists. When I walk the streets and observe the sceneries of Spain, I feel and think with silent admiration of the country's history, its past and present accomplishments, its people and even engage within my mind about "what ifs." I had "A"s in my Spanish classes during my college years (thanks to my Latin classes at the seminary) but unfortunately lack of usage in-and-out of school made me forget. If we knew Spanish fluently, we would have known more about our Spanish history from the viewpoint of the Spaniards and have more basis of critically evaluating our own history, knowing and understanding our presently lost selves as a people. When I visit bookstores and museums I think about our linkage to this country and its people and how much historical wealth we missed and continue to miss and learn from. Unfortunately, as a Spanish friend told me when I saw/visited him last year --after 37 years, we Filipinos have been conditioned to belittle, blame, hate and demonize Spain and the Spaniards in toto. Thanks to the American colonizers and our Americanized minds. I can only and honestly agree. Below is an interesting article which I forgot I had in my collection. The writer Elizabeth Medina has valid concerns. Unfortunately, our perenially subservient, mendicant and corrupt rulers since our so-called independence have perpetuated our ignorance of hidden truths in our history. Our so-called educated and/or uneducated rulers who exhibit consistent mendicancy and subservience to America, due to their ignorance and/or lack of nationalism, have only brought traitorous pronouncements and agreements with our former colonizer America and other foreign nations. Their blatant and worsening corruptibility has deepened our society's poverty, and one of its many unappreciated consequences is the deprivation and neglect of our historians/educational institutions for funds necessary to seek, explore and learn from our historical past. The Philippines has 479 years of written history (from 1521 to the present), and 379 of them have been recorded in Spanish. It is a fact that we have a documentary legacy that is untranslated into English and that therefore we are unable to read - a motherlode that has hardly been mined by our historians. Aside from this, the works of modern Spanish historians, who have researched and published innumerable works on our Hispanic culture and past with such dedication and skill, are accumulating in libraries without the Filipinos' being able to make use of such an invaluable store of new contributions. It is undeniable and curious that the Spanish wrote much on the Philippines, and I suspect that they wrote more about her than about the majority of their American colonies. This surely is due in part to the fact that the Philippines only became independent 88 years after Spanish America. However there can be no doubt that the Philippines in and of herself was a fascinating geographical and cultural space that captured the imagination, scientific interest and human sensibility of the many scholarly Spaniards who spent long years living among the people. Speaking as a non-expert and basing myself on what I have been able to gather from the few contacts I've had with Filipino academics and their writings, from my own inquiries and those of independent researchers, it seems to me that the Spanish-language documentation overflows with gems that still wait to be rediscovered by the scholars of Philippine history. Our historians have not paid them much attention, preferring to study the writings of Anglo-Saxon historians and the few works written by Spaniards and translated into English, for a very simple reason - because unless one has profoundly assimilated Hispanic language and culture, it is impossible to penetrate the deep, implicit levels of meaning in the documentation. We therefore have a double magnification of the problem. Filipino historians and scholars cannot read Spanish documents on one hand; on the other, they study their own history by reading Anglo-Saxons' interpretations of the Spanish documents. Thus they study it from third hand, through the cultural filters of researchers who, though they may possess an operative knowledge of the language, nevertheless have cultural filters that invariably select only those contents that reinforce the particular way of knowing that characterizes their non-Hispanic sensibility and understanding. Therefore, no matter how sincere their interest in penetrating into the profound messages ciphered in the documents, they lack the pitons that they need to scale that cultural glacier. Without pitons and all the specialized equipment that only profound experience and study of the culture that has produced that documentary wealth can give, it is impossible to receive its messages and capture its spirit. This is because, even more important than the external information that they offer, is the inner landscape, adequately grasped and then deployed, that equips a researcher for perceiving all the other information - implicit, invisible, unstated - that underlies the external linguistic content. The result is that, although data and interpretations of apparently great scientific value are accumulated, the human and spiritual significance of that history remains unapprehended. And if we assume - as I do - that knowledge must always incorporate a cultural and spiritual component that goes far beyond mere accumulation of neutral data, that concerns itself most of all with giving orientation to human development, then this manner of proceeding ought to be corrected and reoriented, without further loss of time and effort. Culture, I am convinced, is the gold mine of this new century. It is the last undiscovered continent and the greatest wealth of nations. If a people discovers the way to create in other countries a vivid interest in their culture, and they materialize that fascination in marketable products, they can assure themselves of an inexhaustible source of earnings. Spain has created markets for her music, literature, architecture, fashion; Italy has done the same, particularly through her gastronomy and haute couture; Germany with her engineering know-how, her cars; likewise France, and of course, the U.S., whose products fill our homes to overflowing, even our brains, and everywhere on our planet. The Philippines necessarily must learn to create external markets for her culture, not just the culture of folklore and tradition, which leads to not much more than a proliferation of objects. Most important, the innate talents of the Filipino people, which are already recognized worldwide, must be developed - in the culinary, plastic and visual arts, music, fashion, inventiveness and - something that today is just beginning to arise - the creation of a new literature that gives witness to the marvelous complexity and richness of our historico-cultural experience. All of these things have their deepest roots, their creatives sources, in the culture of the Hispanic-Filipino past. This, without mentioning another issue of extreme importance, which is the development of our trade relations with the Spanish-speaking countries of the Pacific Rim. The 377 years of Filipino hispanization gave birth to a culture and a past that some have tried to annihilate and that is still under siege -- but that refuses to disappear and die. It is a culture and a past that only become visible when -- like the Little Prince of St. Exupéry -- one learns to see with the heart. If one doesn't know how to speak Spanish fluidly, one cannot realize what a wealth of Castilian words there are in Tagalog and in so many other Filipino dialects. If one doesn't carry Hispanic culture within oneself, one cannot recognize the Hispanic culture that informs and suffuses Filipino social customs and practices. If one has no familiarity with the landscapes of Spain and Hispanic America, with their imposing buildings from the Middle Ages and the Colonial Era, one will be unable to recognize the Hispanic past whose faithful witnesses are the old churches, homes and towns of the Archipelago. The fact that the majority of our years of written history took place during the Spanish colonial period and that they are recorded in the idiom of our Hispanic-Filipino culture necessarily places the guardians of culture and education in a position of heavy responsibility. To erase the past is to erase the future. The greatest cultural problem that we Filipìnos face, in my opinion, is that fact that we do not have the habit of reflecting deeply on cultural and educational issues in the Philippines, because as we have said, we were not clarified about the importance of profound culture. Part of the blame rests without doubt on our old Spanish administrators; another on the North American educational system that was implanted afterwards, which necessarily tried to erase the cultural past in order to impose an Anglo-Saxonized present and future. But another portion of blame rests squarely on those who have governed the country and have allowed the love of the old generations for Hispanic-Filipino language and culture to be abandoned under the new conditions of independence, when they surrendered themselves completely to the new foreign power, to the detriment of their own identity and historical legacy. Therefore, though our new proposal cannot be an attempt to flip the cultural tortilla from one day to the next, and - just as English was imposed on us - to impose Spanish this time, what is indeed indispensable is the modification of the educational canon so that our historians, sociologists, anthropologists, writers, architects - all of our agents and formers of culture - may recover a full awareness of the past and be given the option of undertaking profound studies, whether in the Philippines, in Spain or in Latin America, in Hispanic-Amerasian history and culture, in the Spanish language. I am likewise convinced that cultural exhange between Hispanic America and the Philippines cannot but lead to a new synthesis that in turn will produce a blossoming of the best in each one of our countries, thanks to the new climate of brotherhood and unity that it will tend to promote. A synthesis that will help lead our relations with Spain to a new level of maturity and mutual cooperation. The foregoing does not mean that I advocate the separation of the Philippines from her Asian family, which would be absurd, a new backlash under the sign of the very same purism of those who today advocate our fanatic separation from our Western past. The fact is that we Filipinos are a living link between East and West. We come from both worlds, and both worlds are ours. The naturalistic and deterministic look, first of the Spanish and the North Americans, and now of ourselves in front of ourselves, said that we were Indians or Asians and therefore we had to be what we were and nothing more. And this is the origin and the root of the continuing absurd debate about whether the Philippines should be hispanized once again, or not. When the Philippines has always been hispanized, except that the "Filipinos" born from 1901 onwards rapidly suffered, first of all, a cultural switch and the suppression of the past, and later, the outright deformation and annihilation of their historical consciousness. In synthesis, I would say, in answer to the question of "Would it be positive for the Philippines to be hispanized once again?" that the Philippines already is hispanized. All that is lacking is for the Filipinos to realize this truth and make it work for their own benefit, to enrich themselves and progress, instead of impoverishing themselves and regressing. Because regression - unlike progress - has its limits, and it seems to me that we have already reached those limits. "As you know, I am in complete agreement with your thesis. It is a fact, without the Filipinos' knowing it, that the Philippines is a hispanized country. I believe the article is well written and argued. It is necessary to know Spanish in order to dig into one's own past. We must see things as they are: the Philippines - for good or ill - was born as a country under Spanish dominion and her history -- as W.E. Retana well saw it -- must be read in that language, as well as in English, Tagalog, Bisaya, etc. "In the 19th century, Spain's colonies were racked by corrupt administration and internal disorder. Liberal ideologies fired the spirits of enlightened manileños (residents of Manila) like Philippine national hero José Rizal, who studied abroad, and Filipino rebel leader Andrés Bonifacio, who read books on revolutionaries and philosophers........"
"But freedom would not come so easily, for the Filipinos found themselves under their erstwhile ally, the Americans. Under the new conqueror, Manila spread outwards, roads and bridges were built and schools taught Filipinos Western culture in a new language -- English. Democratic processes were introduced; and Neo-Classical government edifices rose around the old city..."
Not one word about the Revolution and the war between the United States and the Philippines, which cost more lives, perhaps, than all the years under Spanish rule! And of course, they also taught the Filipinos Western culture -- as if Spain had not done. But Spain, aside from being Western, is also mestiza [of mixed blood] -- is Jewish, Arab, Roman and Phoenician; in other words, she is as mestiza as her former colonies. Therefore perhaps she has a greater capacity to understand the Philippines than the North Americans. "When Magellan landed on the island of Homonhon in 1521, he claimed these islands for King Philip II and called them 'Felipinas'." Well, my dear, I don't know who taught this writer his history -- two huge mistakes in just one short sentence! The king at that time was Carlos I, and the name 'Felipinas' was coined by Ruy López de Villalobos in 1542 for part of Mindanao or Leyte -- we do not know with precision. Only with the passing of time was the name used for the entire archipelago. At that time, in 1521, it was known as the Western Isles or the Spice Islands, the latter because it was believed that spices grew there, as in the Moluccas Islands. An absolute lack of knowledge about one's own past -- no doubt inherited from an equally ignorant "Thomasite" -- that no one throughout the years has bothered to correct. An utter disregard for the achievements of the Hispanic period. In the Philippines, before the Americans arrived, there was nothing -- only corruption and disorder. Western civilization and democracy reached the islands with Merritt's soldiers (the Cádiz Constitution never existed). And Manila, far from being the vibrant and beautiful city that the chroniclers describe for us (See Morga), did not have a single building worth mentioning, until the "Neoclassical" government buildings were built (might they be copies of those in Washington, D.C.?). [*] Refers to Prof. Guillermo Gémez, Head of the Spanish Department, Adamson University, Manila, who to this day publishes two Spanish-language newspapers in that city. See also by the same author:Who was Wenceslao Emilio Retana? I believe you misread me and think your considerations are somewhat about our superficial expressions of colonial mentality. 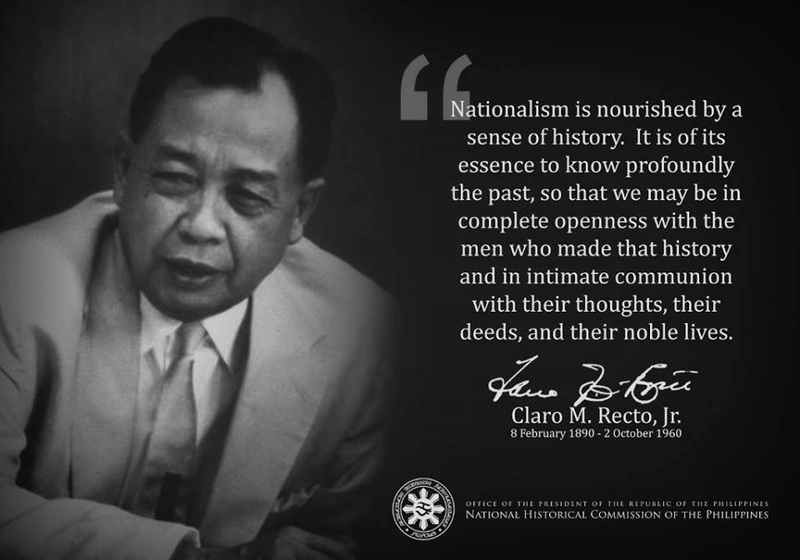 As to talk of renaming etc., well let's do that when we have attained true nationalism not just of Rizal kind -which is of the ilustrado, but more of Bonifacio and Mabini when nationalism flows deeply among a significant majority. By Hispanized, I meant learning more from our Spanish history, we can know and understand more of ourselves. We have limited ourselves to the American and fellow Americanized version of our history. We can not reject everything in our history, including about our former colonists; our Malayan heritage is also incomplete and much less known if not mostly forgotten; thanks of course to our former colonists (actually Spaniards helped us maintain it by not teaching the Filipino natives/masses the Spanish language and thus ignite our nationalism). I have written about Hugo in my blog and am coincidentally reading his book HUGO!. The great difference is he comes from the masa, did not forget his roots and uses his acquired knowledge of Simon Bolivar, of Ali Rodrigues and Petkoff, Fidel and Che, etc. to sincerely fight for and improve the plight of the Venezuelan masa. That's why America is demonizing him. To me, the thesis of Elizabeth is seems more of a report than a thesis. She stated more of facts than opinion or even of her own analysis. The fact is, it was hidden by the American invaders in 1899 to destroy our identity so as to destroy our capacity to differentiate self from foreign. The fact is, a disease of the immune system known as autoimmune disease, exists at the biological level. It is a development malfunction of the immune system in which there is a failure of an organism to recognize it's own constituent parts as the self. It attacks it's own cells. Example of this is systemic lupus erythematosus. The fact is, this also exists at the social level. This is the case in the Philippines. An example of this is the killing by Filipino soldiers of our brother Filipinos tagged by the government as insurgents. this label originated from the Americans who labelled our brother Filipinos who resisted their invasion as insurgents. This is being continued today. Any Filipino who undergoes training in a Filipino military unit would enter in an orientation where the only recognized enemy is a Filipino. Never is there in the orientation, any possibility that the enemy is a foreigner. That is why combat training is basically oriented in counter-insurgency. We need to pool our resources and coordinate if we are to accomplish the realization of this truth in existence but is deeply hidden by an existing subtle enemy. We need to communicate more often. Much of our written history, written or re-written by our then American colonists, has been distorted and/or the truth kept hidden from us; lending truism to the saying that victors write history. The use of the term "bandits" or "insurgents" have been used throughout history, as was employed by the American colonists. This tactic by the colonists (and its native, trained servants/soldiers of today) has been useful in demeaning and demonizing the enemy and rationalizing their own brutality towards the latter. I hope you can read this, as two years have passed since the last exchange I am reading here. This is Elizabeth Medina, thanks for posting my essay in your blog. I like your way of thinking; I too have very good feelings toward the Spanish, most of all the ordinary hardworking people I've seen and interacted with in ordinary ways in Madrid, the friends I made with young historians. I also love our people, I feel Filipinos are very very special, we just have been distorted by our past. But understanding that past helps us reconcile with everything, including our image of self and thus image of the others. I learned in Chile that I can accept the Chileans with their virtues and faults and be at peace with that. I feel the same about my fellow Filipinos. P.S. I really would like to study classical Tagalog. It is the other part of my heritage that my education deprived me of. This is out true identity. We Filipinos are Hispanics. Nothing to be ashamed of it. And once we learn to accept this fact, once we have been freed from WASP mind-conditioning, once we have been freed from textbook-based hatred, then and only then can we shake of the shackles of almost everything that has been putting us Filipinos down. It is time we have a fresher appraisal of our history.